Whether you’re a celebrity or a major brand, Facebook is still by far the most effective platform — at least judging by audience size. Celebrities Britney Spears and Lady Gaga are the most followed pages on Google+, each with more than 7 million fans. On Twitter, Justin Bieber tops the list with more than 44 million followers and Katy Perry with 42 million. Twitter’s not bad as a platform for celebrities, but it’s still a ways from matching Facebook. On Facebook, Rihanna and Eminem each have over 70 million followers. 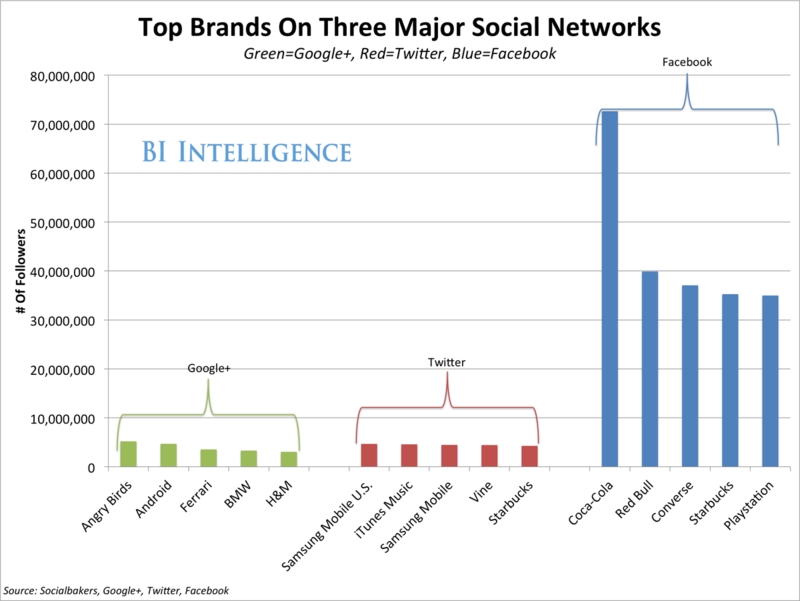 If we narrow down the list to brand pages, we see a similar pattern, with an even more dramatic advantage for Facebook. The top brand on Google+, Angry Birds, has 5 million fans, whereas the top 150 brands on Facebook all have over 5 million people following their page. Coca-Cola has over 70 million fans on Facebook. Red Bull, Converse, Starbucks, and Playstation have between 30 and 40 million fans. It may be that the ability to embed Google+ posts — which will allow users to share Google+ content around the Web — will lure more brands and public figures to Google’s social network. < em>Download the charts and data in Excel. Editor’s note: We offer our long-term sponsors the opportunity to write posts and tell their story. These posts are clearly marked as written by sponsors, but we also want them to be useful and interesting to our readers. We hope you like the posts and we encourage you to support our sponsors by trying out their products. Apple versus Adobe. Facebook versus Google. Twitter versus its own developer ecosystem. At the recent Web 2.0 Expo in San Francisco keynotes and hallway conversations revolved around the latest platform battles that are actively defining and re-imagining the future of our increasingly mobile, social, and real-time reality. But technology platforms such as AOL, Microsoft, Amazon, Yahoo, and eBay have been experiencing these cycles for years, spawning large ecosystems that in turn created huge opportunities for partners, developers and competitors. Evolution is inherent in any ecosystem and today’s platform battles are just one spike in the Web 2.0 maturation curve. Observing the renaissance of social ad platforms (note AdMob, the launch of iAd, Promoted Tweets) we at Mashery realize that while analysts and media remark on corporate goings-on, there has been a lack of interest in understanding the developer community that is a meaningful part of the 2010 platform wars. Mashery, an API infrastructure and management company, polled nearly 600 Web and mobile application developers at SXSW Interactive this spring to take a pulse on what they love and hate about developing on different API platforms. By peering into the mindset of a developer building applications with APIs, we extrapolated ecosystem insights and presented them to you here. View more presentations from Mashery. What are the best APIs out there for developers? What are the most helpful resources to you as developers? Why do you work with APIs? What platforms and devices do you build applications for? What are the best APIs out there for developers? There is no real surprise when we announce that the top three APIs named as the best to work with are Google, Twitter, and Amazon (69% of respondents). But interestingly, we see a solid number of smaller platform players emerging. Tag cloud based on 828 responses from 502 developers. If you’re a current API provider, or you’re thinking of advancing an API program by opening up your data to developers, there’s plenty of room for targeting the niche of your business. Since the landscape of the API providers is not conducive to a winner takes all conclusion, there is a thriving, healthy long tail of developers who are interested in new platforms and creative innovation. The secret sauce is in the type of data you expose, and how simple you make it to access your data. “Going by past evidence, [even] closed ecosystems… still allow for opportunities to be made at the edge of the ecosystem in areas the platform owner deems too small to bother with,” writes VentureBeat. With nearly 2,000 APIs listed on ProgrammableWeb, there is more room for compelling data to be re-mixed and re-used into different user experiences across multiple devices. What developer resources are most helpful when building with APIs? If you want to better communicate with your developer community, it’s a senseless exercise to compare apples and oranges, but Apple to Twitter – valuable lessons learned. Chart based on 1072 responses from 542 developers. Provide timely bug fixes, “working tutorials, demos and BBS, and sample apps” on the developer portal. As an API platform provider, knowing more about who your developers are and what they rank highest in importance is the best indicator for resource prioritization. Build support tools that your ecosystem actually wants, or needs. It’s human nature to flock towards the friendliest habitat for growth and survival. 3. Passion first. Paycheck second. Why do developers work with APIs? The Valley is filled with startups and garage coders with a vision of how to do something better, paired with the energy, drive, and desire to build the next great thing. Entrepreneurs may dream sweet dreams of fame and riches but at the core of Silicon Valley, Silicon Alley, and everywhere in between is solving a problem in a technically elegant way in front of your peers. That is its own reward. Additionally, of the 569 responses from developers attending SXSW this year, more than a quarter of them came from companies with 30 plus employees, which demonstrates interest and support for API initiatives from larger organizations. Almost 1/5 of developers attended SXSW Interactive for their “own personal projects,” and nearly 2/3 cited reasons beyond “because my employer pays me to,” which demonstrates personal dedication to the field. One thing we were very interested in when we laid out our questions to this community was figuring out which were the most popular programming languages. Where are developers building apps and extending into new devices and channels? Online/browser and Mobile are clearly the dominant development platforms with almost 3/4 of survey responses. Desktop and Set-top and Gaming Consoles have yet to attract strong developer adoption. Currently, only the Xbox360 console is open to scalable app integrations, while Adobe AIR and Microsoft Silverlight are still waiting to take off as market opportunities. Only 3% of this developer population is focused on hardware, but we expect that to change as major mobile operators and manufacturers supply more app-friendly handsets into the hands of mainstream consumers.